In response to the advent of Washington’s Doctrine of Pre-Emptive Strikes, Moscow is preparing to unveil a space shield with no less of a global reach. Hypersonic pilotless aircraft are set to become the next phase in the military technical standoff between Moscow and Washington. In response to the advent of America’s Doctrine of Pre-Emptive Strikes, Russia is preparing to unveil a space shield with no less of a global reach, that of her Aerospace Defence Forces. This development represents the revival of one of the central themes of the Cold War era - the possibility of ‘Star Wars’. Unlike director George Lucas, the 40th President of the United States Ronald Reagan knew very well that a war in space was no longer a distant prospect. In the last century the only thing that prevented him from realizing the idea of total American supremacy over the Soviets during the 1980s was the absence of the required technology. America acquired this technology 25 years later following the end of his presidency. Last December, Russian President Vladimir Putin noted that the advent of hypersonic, pilotless and space strike threats from Washington, and the potential for these weapons to be used, could lead to the instantaneous disabling of Moscow’s defences. “Effective aerospace defence is a guarantee of survivability for our strategic deterrent forces, and of the country’s protection from aerospace strike threats,” said Putin during a visit to an air defence missile manufacturing plant in June 2013. Military expert Igor Korotchenko is certain that the task in hand requires an understanding of contemporary military threats that Russia could face in the course of the next 15-20 years. They lie in the fact that a series of countries, first and foremost the United States, are actively carrying out research into producing hypersonic military strike threats. These will operate not only in the air but also in adjacent space. This gives rise to a requirement to enrich the existing Aerospace Defence System (Vozdushno-Kosmicheskaya Oborona, or VKO) with advanced anti-aircraft and anti-missile defense (Protivovozdushnaya Oborona i Protivoraketnaya Oborona, or PVO-PRO) systems. In March, a Scientific Research Institute for Aerospace Defense was set up in Russia. This institute is tasked with developing a surveillance and warning system for an aerospace attack, and for striking and jamming aerospace threats, as well as developing control and maintenance systems for the existing Aerospace Defence Forces. The Strategic Aerospace Defense Systems concern (Strategicheskie Sistemy Vozdushno-Kosmicheskoi Oborony), which brings missile and radar developers together, is to work on the practical side of this project. Of the 22 trillion roubles ($616 billion) allocated to the entire program of rearmament of the Russian Army by 2020, Moscow is to spend around 20 percent of this allocation on its ‘Zvyozdnye Voiny’ (Star Wars) program. This amounts to around 3-4 trillion roubles ($106 billion). Given this funding, work has already begun on global reinstatement of a unified radar field to provide early warning of missile launches. The latest Voronezh-DM radar system is being deployed along Russia’s borders. This system is capable of seeing anything happening up to a distance of 3,000 km from the country’s borders. 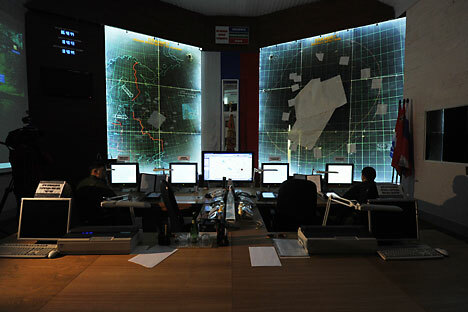 These radar stations have already been installed in the Leningrad, Kaliningrad, and Irkutsk regions, as well as in the Altai and Krasnodar territories. It is proposed that they be located at a distance of around 1,000 km from one another. According to Deputy Defence Minister Yury Borisov, by 2018 they will form a defensive radar system encircling Russia. Is this a new arms race? Aside from developing an early warning system for aerospace threats, Moscow is actively developing a strike threat of its own. Recent years have seen a large-scale modernization of Russia’s A-135 anti-missile defence system deployed around Moscow. In addition to this, deployment of the Pantsir-S1 close-range anti-aircraft system is planned, as well as 28 anti-aircraft missile regiments equipped with the S-400 Triumph, (which amounts to around 450-670 launch sites) and also 38 batteries of the advanced S-500 Vityaz system (this amounts to around 300-460 launch sites). According to Borisov, several new manufacturing plants are under construction in the Kirov and Nizhny Novgorod regions to produce these defence assets. The cost of these new plants is estimated to be more than 36 billion roubles ($1 billion). Work on a similar scale is underway to raise the combat potential of Russia’s strategic armaments. Since the U.S. pulled out of the Anti-Ballistic Missile Treaty, Moscow has tested six new types of intercontinental ballistic missile and introduced these into service with army and navy nuclear deterrent forces. All of them, in contrast to those that come under Russo-American limitations treaties, are fitted not with a single warhead but several nuclear warheads each. Moscow is certain that plans to develop its aerospace defence will not lead to a new Cold War. The discrepancy between Russian and American defence spending on these outcomes is vast.